14 of the finest works from the universally acclaimed Master of Suspense come together for the first time in one collection. These captivating landmark films are the genre's most enduring and spine-tingling classics and boast three decades of Hollywood legends, including James Stewart, Grace Kelly, Anthony Perkins, Sean Connery and Doris Day. 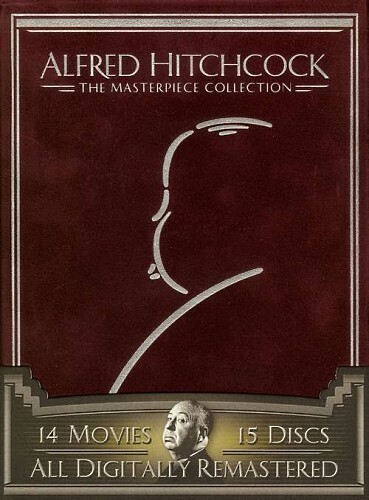 The premium packaging and collectible booklet make Alfred Hitchcock: The Masterpiece Collection the must-own, definitive anthology of gripping works by a true genius. This absolutely gorgeous looking set was given to me by a very generous friend for Christmas. I was considering saving these for later... but I really couldn't wait to dig into these. I am not making this a weekend (2 to 3 day) marathon... I am leaving it open so I can watch the movies whenever the mood hits... as many as I feel like... when I feel like watching them. So this could be a long running marathon... or if I get drawn in too much it could be very quick. Most of the movies here (10 out of the 14) I have never seen before. My plan for the order I will watch these in... is to watch them in the order they are listed on the back of each digipak. I didn't look too closely to be sure... but I believe this is the production order. This riveting wartime thriller stars Robert Cummings as Barry Kane, a Los Angeles aircraft factory worker who witnesses a Nazi agent firebombing his plant. However, it is Barry who is accused of the fiery sabotage, and to clear his name he sets off on a desperate, action-packed cross-country chase that takes him from Boulder Dam to New York's Radio City Music Hall to the top of the Statue of Liberty. Hitchcock's first film with an all-American cast moves with breakneck speed toward its final heart-pounding confrontation, and remains a suspense classic. This is one of the several movies in this set that I have never seen before. I really liked the storyline of this one. And it really had a good start... a very interesting and entertaining first good half of the movie. The rest of it was pretty good as well... though the second half did have some slow parts that was a little more difficult to get through. Sure this movie goes a little heavy on the patriotism... but I think that is understandable between the subject of the movie and the times it was made. It is definitely worth seeing... but I can't say it is my favorite Hitchcock movie. Hitchcock collaborated with renowned playwright Thornton Wilder (Our Town) to create this psychological tale of family drama, suspicion...and murder. Joseph Cotton shines as Uncle Charlie, a seemingly charming man visiting his relatives in their small and peaceful hometown. But when his namesake niece, "Young Charlie" (Teresa Wright), suspects that he may in fact be the psychopathic Merry Widow killer, Uncle Charlie must plot the death of his favorite relation in order to remain one step ahead of the law in this murderous game of cat-and-mouse. This is another movie I never seen before. While I enjoyed this one... it is not a favorite. It just don't rank up there for me as those such as Rear Window or Psycho. But it is definitely an interesting story that is well worth watching. I liked the character of Charlie (the niece) the best. Even when scared you could tell she is a strong woman... which is something I always liked... and a bit surprising going by the times this film was made. Teresa Wright, who played the niece, looks so familiar to me. But I must have been confusing her with someone else... as this seems to be the only thing I have in my collection with her in it. Joseph Cotten, who played Uncle Charlie, also did a fine job. I did get a kick out of the father and his friend always plotting each other's murders for fun. So as I said... this is a fine movie... but not the best Hitchcock movie I have seen. 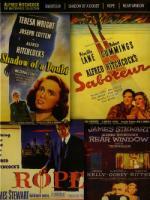 It certainly isn't as entertaining as some of his others, but the basis of Shadow of a Doubt is the perfect Hitchcock formula and was apparently his favourite. It's a story about a normal family dealing with a horrible murderer, which is what he loved the idea of: murder on your own doorstep. As you watch these films, note how often the hero is a normal person, thrust into an extraordinary situation. I can't help but think that the two guys planning the murders for fun represent Hitchcock himself! I definitely can't argue against this. Just a personal preference type thing on the entertainment value for me personally. I definitely could see that as well! I may hold off a little while before watching it (maybe later today... or maybe even later this week)... but next up will be Rope. It is one I am looking forward to seeing... the premise sounds like a lot of fun to watch. And I have grown to really enjoy James Stewart's work. It's a great film, Pete, but can be a little stilted. It was an experiment to see if Hitchcock could make a thriller using one set and one take. Limitations of the cameras meant the reels were only good for 10 minutes or so, but clever editing makes it look like one continuous shot. The set itself is even cleverer, allowing the camera to move freely throughout the two room apartment where the story takes place. It's fun if you go into it with the right expectations. Thanks for the heads up... I will be sure to keep it in mind. Oh who am I kidding... I think I will go ahead and pop in Rope! James Stewart, Farley Granger and John Dall star in this macabre spellbinder, which was inspired by a real-life case of murder. Two thrill-seeking friends (Granger and Dall) strangle a classmate and then hold a party for their victim’s family and friends, serving refreshments on a buffet table fashioned from a trunk containing the lifeless body. When dinner conversation revolves around talk of "the perfect murder," their former teacher (Stewart) becomes increasingly suspicious that his protégés have turned his intellectual theories into brutal reality. This is another one I never seen before... but it is one I have heard of and been excited about checking out. This one has James Stewart in it... and I am becoming a fan of his work. And this one is no different! Such a great piece of work here! From the opening scene I could see this one would be a bit different... as it isn't actually about a mystery. Well maybe a bit of a mystery to the characters... but we, the viewers are let in on the answers from the very beginning. I thought for the most part everyone did a fantastic job. If there is anything at all that I didn't care for... it had to be the character of the housekeeper. I can't put my finger on it... but there was just something about her that bugged me. The storytelling was fantastic... and you can see a real difference in the way the movie was shot... but in a good way... I definitely enjoyed it. This one will rank up there with my favorite Hitchcock films. Next up is Rear Window... I watched that one not terribly long ago... so I will stop here for a short period. I started to pop in Alone in the Dark... but I couldn't imagine following Alfred Hitchcock movies with one by Uwe Boll! Who can you follow up with Uwe Boll? Glad you liked Rope, Pete. One thing to bear in mind is that Hitchcock never did mysteries. He was the master of suspense, precisely because he never under-estimated his audience and always let the viewer in on the joke as early as possible. I think there is more to enjoy in "are they going to find out" rather than "I bet he did it!". There might be a couple of exceptions, but never look for a whodunnit. You should re-watch Shadow again sometime in the future, it's definitely better than the two other films you've watched.